Woza Moya Project ,“Come the spirit” in Zulu, aims to provide quality community care and support for people infected and affected by HIV/AIDS in the Ofafa region of KwaZulu Natal. Their focus is HIV/AIDS prevention, health care and poverty alleviation. The core of their program work is home-based care, orphan intervention, HIV/AIDS information and counseling, basic medicines, paralegal services and food security. The services of their team reached eight thousand people in 2009. The Woza Moya Community Centre, which was built in 2005, is situated on tribal land, which is home to +/- 23,000 people who live without electricity, telecommunications or sanitation. One road connects the entire area, which becomes inaccessible during the rainy season. It is against this backdrop that Woza Moya operates its programs. With unemployment at 83.5%, residents survive on an income of less than R1,500 (approximately $150 to $200) per month. 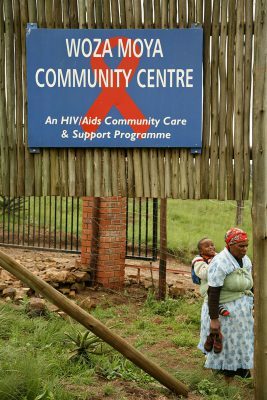 HIV/AIDS in this region is estimated at one of the highest prevelance rates in South Africa. In 2003, one study showed that that 47% of pregnant women presenting themselves at the antenatal clinic were HIV positive. Children are, in many ways, the most vulnerable group in the community and have been targeted by Woza Moya as a priority. The work of Woza Moya has grown out of listening to the needs of the community they serve. The way they work is as important to them as what they do. To that end, their programs reflect a developmental approach that is responsive, flexible, community-based and entirely delivered by people within their own communities.